The space inhabited by feminine poetry is full of vapid ladies who even in old age spout sentimental idiocies or mystical nonsense. Very few seem to be involved with the reality existing outside the lyrical ego. But in Miriam Ventura’s poetry we find a new discourse, a refreshing “anger of love”, not coy, playful, loud and mocking. 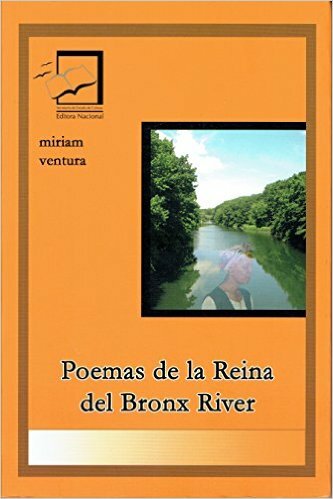 In Poemas de la Reina del Bronx River (Santo Domingo: Editora Nacional, 2009) she creates a verbal flow of epic proportions—104 poems in 14 sections—and builds an imaginal reality based in a dual concrete reality—the Bronx and her own island, the Dominican Republic. She installs a personal cosmogony with which, however, anyone who has undergone the experience of what Ventura calls “transnationality” can identify: the experience of being uprooted, of migration, of diaspora. Thus, Ventura places her poetic alter ego—the Queen of the title—within a simultaneously mythical and historical time. A difficult collection of poems, which could have been turned into several books, but is solidly built around a thematic unity while allowing for innumerable digressions. The kind of poetry that prepares us for the inevitable change that death constitutes, and that Ventura confronts with picaresque insouciance as in the poem “He aquí todos mis bienes” (Here are all my Possessions) in which she lists all her possessions and gives instructions on how to dispose of them. A poetics of cruelty, supporting a feminine identity which encompasses the infinite fierceness of a Queen of Hearts or an Elizabeth I, and the innocence of an Alice falling through the whole or an Antonin Artaud, trapped in his schizoid visions. A queen who can be dethroned with a chess move. A Queen who knows she will disappear. A Queen who recognizes an integral component of every feminine psyche: the androgynous voice she carries within. An imaginary Queen, whose watery empire simultaneously stands for inexorable temporality and the triumph of the Word over immanence? And also, a Queen who does not take herself seriously, who mocks herself, her minions and even the world she has so laboriously built. Her Bronx River is really a polluted stream, the recipient of industrial waste from the more than a thousand factories lining its borders. Ventura has actively participated in the task of cleaning and restoring her beloved river’s environment. In Ventura’s metaphors and images there exists the deliberate intention of challenging the reader to decipher erudite allusions to her adopted religion’s ceremonies, African and Caribbean foods, rituals of obscure cults, unknown geographical zones. Her style is characterized by a verbal alchemy which transforms common shapes and objects into surprising constructions. For example “Duró más de once meses/ quitándole las frazadas al hielo” (She spent more than eleven months/ taking the blankets off the ice), from the poem “Sumario de crónicas” (Summary of Chronicles). At times her style fills with a biting humor which observes, registers and exposes the some times sordid underside of daily experience. Thee great themes define the collection. The principal symbols: water and the moon, continual change, as in the philosophical theories of Tales and Heraclitus. The trickery of ginocentric control: a Queen who rules from the center of her empire but knows such rule is temporary. A changing, fluid empire, inhabited by humble fish and legendary creatures. The need to manipulate a fatal biology over which she nevertheless takes control through the use of words. Ventura refers to Artaud, but she is closer to Vicente Huidobro, the great Chilean poet whom she resembles in terms of sensibilities. Both, masters of verbal alchemy. Listening to her as she reads, one becomes aware of the degree of verbal magic she has achieved: the word games and arresting images become less important than the mesmerizing rhythm and the melody. As the immortal Verlaine said: all poetry must aspire to the condition of music. Let us say: direct communication, pure sound. I have never read a female Caribbean poet that could create such a complete imaginal universe as Miriam Ventura’s. I want to close this brief commentary by quoting from Basilio Beillard’s excellent review for Diario Digital RD : “I invite you to read this book, which reads as an anthology of chance and a verbal body which will remain within Dominican poetry as a vital point of inflexion..” But I disagree with his statement that it is “a female voice that sighs”. Ventura does not write from biological parameters, that is, she does not produce stereotypically female poetry. She is a poet who celebrates her own trangressive existence, implacable with her binoculars, propelled by the anger of her love.